Our Association, which meets in Edinburgh, provides an opportunity for Scots, Norwegians and friends to get together and to celebrate important Norwegian events. Whether you have a family connection with Norway, or just a love of Norwegian or Scottish culture, why not come and join us? Ye’ll find a ‘hearty welcome’! 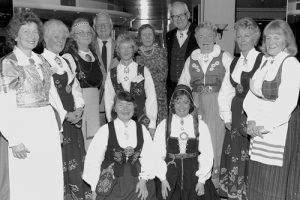 Founded in Edinburgh in 1966, our Association has enjoyed over 50 years of Norwegian-Scottish friendship. Learn about our history here. Explore and learn about our Events, browse our Ditt og Datt This & That news articles, and enjoy a few Did you know? Norwegian-Scottish facts. Why not come and join us? We love making new friends! More information about how to become a member here. You can learn more about our aims and activities here, and our committee here.